Elenor came to an event at Transition Café about 18 months ago and stayed to help with the washing up. “It was such a good atmosphere , with such lovely people that I just kept coming back.” She told Fish, while she poked the centre out of the cut leaks that are destined for a nourishing pot of Cawl. And it seems there are other things I didn’t know, such as how Aster, Elinor’s medical assistance dog has changed her life for the better. So you have a recycled dog? 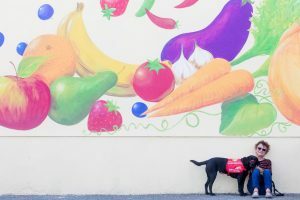 We laugh, but Eleanor goes on to tell me just what a difference Aster has made to her life and how keen she is to promote awareness about assistance dogs and to raise money for their training. She goes on to tell me that it was hard having to give up her work because of her health issues. She had had 40 years working as a community development advisor in some of the most deprived parts of Pembrokeshire. Aster has made the world of difference, but so has volunteering at Transition. So how is it working here at Transition café? She goes on to tell me about Natasha’s foraging and the delicious wild garlic and nettle soup that has been a big hit and how popular the salmon and veg pie is proving. So how often are you here? What if people don’t fancy working in the kitchen but want to get involved?